This tab is only available to Admin users of the account. Some items can be changed others are for reference only. 1. This is the date format that any dates within the system are shown as. 2. This is the offset time of the account for GMT, enter +/- number of hours. So for a country which is 2 hours ahead of GMT, enter +2 in the box. 3. This is for reference only to the undeliverable values that are written to the field CRM_Per_Undeliverable. 4. This determines the use of CSV Temp table. We strongly recommend that you do not amend this without first speaking to support. 5. This is the list of authorised IP addresses. 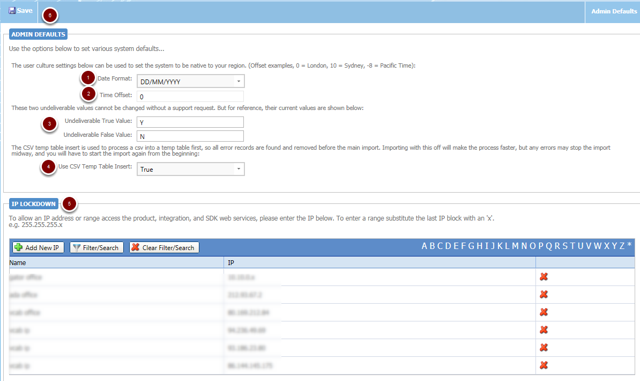 You can manually add IP's here for your users, this where any that have been authenticated upon login get added. 6. Click here to save any changes you have made.